The ka-ching of cash registers is music to retailers’ ears. In building a retail empire, however, there’s a lot more involved than simply ringing up sales – inventory management, customer relationships, the ability to accept various payment types, and a whole bevy of others. Thanks to the cloud computing technology for retail businesses and point-of-sale (POS) software, managing a store or outlet, or even hundreds of them, online or brick-and-mortar, has become a lot easier. 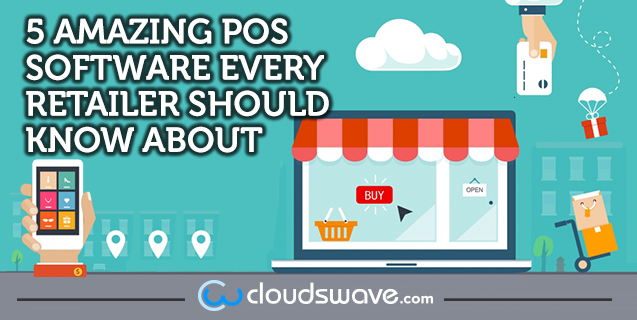 Aside from tallying your sales for the day, POS software can perform a myriad of functions, not the least of which are inventory and staff management. And then, there are real-time summary and detailed reports that let you visualize the overall health of your business, allowing you to make informed decisions in the process. Made specifically for the iPad, Revel Systems is a cloud-based full-featured POS software designed for a whole host of businesses including bookstores, museums, pawnshops, sporting goods stores, florists, bars, restaurants, grocery stores, food trucks, and stadiums. Revel Systems has multiple software version packages to choose from depending on the number of terminals and features your business requires. Their sales department can be contacted for pricing. A solution that’s platform-agnostic, Lightspeed is definitely not just a cash register. Among other things, it helps users manage their inventory through millions of pre-loaded items, bulk inventory management, item sort and search, tracking of serialized items, printing of labels, creation of multiple item variants, and combining items together. Lightspeed has three pricing plans: Small at $76 per month for one user, Medium at $128 per month for two users, and Large at $222 per month for four users. Additional users can be added to Large plans at $51 per month. Credit/debit terminal. Shopify lets you use the terminal you already own to track credit or debit card payments. Offline order acceptance. Orders placed while offline will automatically be synced the next time you connect to the Internet. Split tenders. Two or more payment modes can be accepted in one transaction, such as multiple credit cards, or cash and debit card. Gift cards. Gift cards that are redeemable online or in store can be printed by your receipt printer or emailed to customers. Custom payments. Custom payment options can be created so your store can accept cheques, gold coins, or IOUs. Partial payments. With Shopify, you may even allow layaway plans for certain products. Discounts. Discounts by dollar amount or percentage can be offered. Shipping. Recording a customer’s contact details and shipping address lets you ship orders at a later date. Taxes. Based on your store’s location, taxes are automatically calculated. Custom taxes can also be set, if needed, for specific orders or products. No checkout counter. Because your POS is on your mobile device, the register can easily be brought to the customer. Refunds. Past orders can be refunded back to customers via their original payment method, or as store credit and gift cards. Order history. Shopify lets you view all orders made online and in store. It also allows you to search by product, customer or order date. Daily totals. Daily totals are tracked for all payment types. Staff accounts. Multiple staff accounts can be created, and all register and order activities are monitored for each account. Accounting integration. Shopify easily integrates with accounting software such as Xero, QuickBooks, and more. Shopify offers a risk-free 14-day free trial. Paid plans start at $9 per month for Basic, $59 per month for Professional, and a monthly $159 for Unlimited. A retail package add-on is another $40 a month, and the online store add-on is an additional $20 per month. Cash management. Bindo makes it easy to manage shift activity by automatically tracking all shift transactions, with an option to calculate the expected cash amount when a shift ends. Inventory management. Bindo’s simple scan technology (SST) lets users scan a barcode and the product’s photo and description is automatically retrieved from a database of over 10 million products, while custom inventory reports let you view real-time updates of your sales and stock. Customer and loyalty. Customer profiles are created and organized during checkout, allowing you to personalize the customer experience and thereby enhance profit margins. Analytics and reports. Bindo’s analytics and reports feature gives users a comprehensive breakdown of cost, revenue, margin, and so on. It analyzes your income statement to help you optimize your bottom line, scrutinize your best (and worst) products in terms of sales, compare your sales numbers against past figures, and flexibly view your sales reports using advanced filters. Gift cards. Create brand awareness and increase sales through customized gift cards that feature your brand’s logo. Invoices. Bindo supports various payment modes, including partial payments. Purchase orders. Purchase orders can be submitted to vendor partners in just a click of a button. Discounts. Depending on the sale scenario, discounts can be applied. Time clock. Using a PIN-based employee management system, Bindo lets you track your staff’s time on the job. QuickBooks and Xero integration. For easier accounting, Bindo has ready-made integrations with QuickBooks and Xero. Multi-store management. Manage multiple stores by switching between stores with ease and speed. Apple Pay support. Bindo POS is an Apple Pay-enabled solution. Credit card terminal and register. Bindo POS works with approximately 99% of credit card processors. Bindo offers a 14-day free trial. Sell more products. Vend connects with hardware like receipt printers, barcode scanners, and cash drawers to make selling to your customers easier. It works even while offline, and your sales figures are automatically updated the next time you connect to the Internet. Get paid quickly. With Vend, you get paid easier, as the service lets you accept various payment types – cash, gift cards, cheque, debit/credit cards, or mobile payment. The app integrates with a number of mobile payment solutions such as iZettle, PayPal, and Tyro. Expand your customer reach. Because Vend is mobile, you can literally bring your POS terminal to your customers on the shop floor. You may even hit the road in search of new markets and customers. Vend also has a built-in customer loyalty program that lets you reward repeat purchases. Manage your inventory. Whether it’s a single product or thousands you’re selling, Vend lets you easily manage your inventory by adding retail prices, discounts, tags, organizing products into bundles, grouping them by color or size, and performing bulk operations like export and import. Because it’s cloud-based, you see which items are in stock in real time – anytime, anywhere. Understand your business. Real-time reports allow you to view snapshots and detailed breakdowns of your sales, product, and staff performance, enabling you to add new registers where necessary with just a single click. Sales targets can be set on a daily, weekly, and monthly basis, and top performers can be monitored from your Vend dashboard. Integrate your Vend data with other business applications. Vend supports integration with third-party apps like QuickBooks, Xero, Stitch Labs, and Swarm. It also has an API that allows you to customize Vend, or build your own custom application. Vend has three subscription plans. At a monthly $59 is Medium, the plan for new retailers with a small catalog of products. It supports a single outlet and 500 active products. Large is at $85 per month, if billed annually, and supports a single outlet and unlimited products. It’s best suited for growing retail businesses. Extra Large, which is priced at $169 per month, if billed annually, supports multiple outlets and unlimited products and is ideal for retailers with multiple outlets or stores. A retail business is built on three pillars – sales, customers, and inventory. POS software allows you to accurately keep track of each of these pillars to confidently grow your business.